We warned back on Tuesday that severe storms would be possible today and now that seems to be the case. I am worried that at least one tornado will be reported in the area outlined on our custom map below. This could get very dangerous from 1-7pm across many areas and wind damage will be the greatest threat. Let me remind you that it does not take an actual tornado to have wind damage. In this setup, we could see some rotating severe storms. Combine that with being on the right exit region of the 250MB jet stream and you have a recipe for some severe weather. The predicted STP (Significant Tornado Parameter) values are elevated from about I-85 and points east in the Carolina’s. Also, helicity values are running high and this will increase the chance of rotating thunderstorms and super-cell structures. These storms will be fast moving but some training of storms could occur in part of the area and that would lead to flash flooding concerns. Another round of severe weather is possible next Tuesday – Wednesday time frame. This is already being watched by the SPC and you know to take it seriously if they are this early. We have posted our map of what is expected below and will provide a member update on this next Monday. 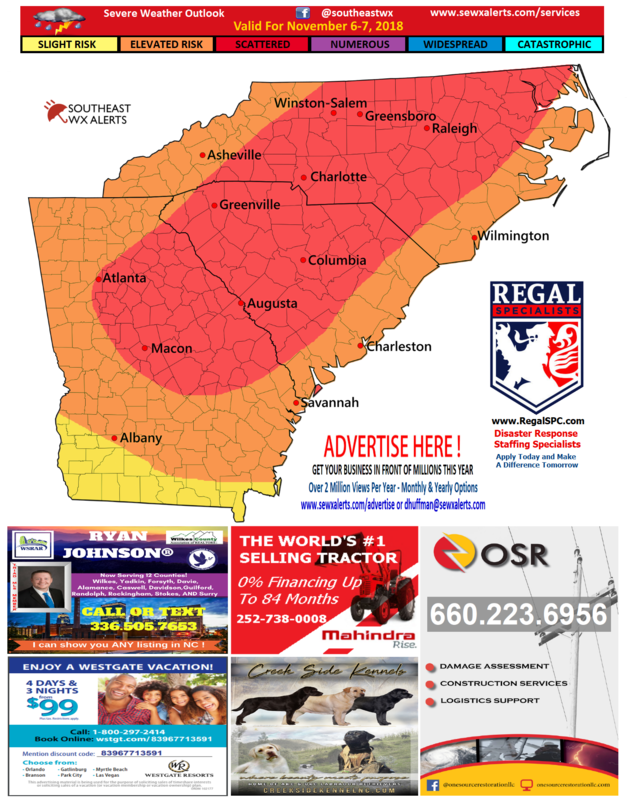 If you subscribe to our service, then watch for severe weather text alerts on your phone and to your email should severe storms or a tornado threaten your area. If you are not subscribed, then consider a subscription and you will get a plethora of benefits.